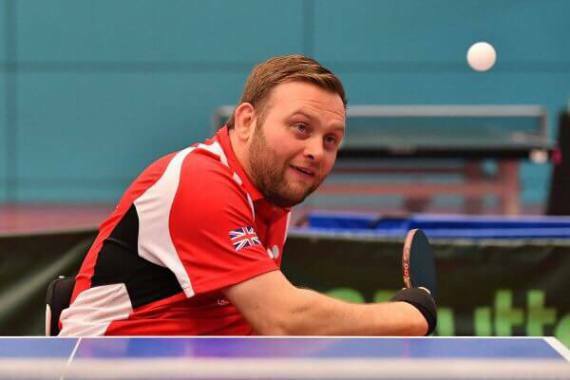 Wales’ Paralympic champ Rob Davies will spearhead a 14-strong GB squad for the World Para Table Tennis Championships in Slovenia. Brecon’s Davies is one of four Welsh players in the squad being joined by Bridgend’s Paul Davies, Paul Karabardak from Swansea and Aberdare’s Tom Matthews. Davies, who won the Para title in Rio 2016, will be joined in the squad for the championships, which run from October 17-20, by fellow Para champ Will Bayley. The 34-year-old will be bidding to add the World championship to his men’s class 1 Paralympic and European titles, having taken silver in 2014. Davies has only played one tournament since retaining his European crown last October but has reached the final of the last five major championships, winning four of them. “Although the Czech Open last month didn’t go according to plan I can still take a lot out of it because that is why I went there – to see what I needed to strengthen. Namesake Davies was also making his first appearance since taking bronze at last year’s European Championships when he was knocked out in the group stages of the Czech Open last month. But he is a great competitor and knows what it takes to medal at the major championships. Paul Davies confident preparations going well for the worlds. The 51-year-old said: “Preparation has been going well and training has been good in the last couple of weeks since coming back from the Czech Open. “I feel that I am at about 90per cent where I should be and I’m looking forward to the challenge. Hopefully we can have a 1-2-3 on the podium as we did in the Europeans last year. “I didn’t play badly in the Czech Open but nine months without playing a tournament is a long time. So going by how my performance was two weeks ago I think I’m on course for a good result. “At the end of the day Tom, Rob and me are in the same class but we play for the same country and we support each other on and off the table and I just hope the three of us can get on that podium. Three-time Paralympian Karabardak will be competing in his fifth World Championships and won the deciding singles match that secured gold for Britain in the men’s class 6 team event at the European Championships last year. Karabardak has already been on training camp in Slovenia. “My preparations have been going really despite problems with my wrist,” said the 33-year-old. “We had a great training camp in Slovenia last month which I felt I got a lot out of as I experienced different styles and players I don’t normally train with. “I can take confidence from my performance in the Europeans last year and I think if I can play my game while keeping focused and confident I will have a good chance to do well at the World Championships. Matthews took silver in the European Championships last year, losing to Rob Davies in the final, and won the Italian Open in March. He will be competing in his first World Championships. The 26-year-old said: “Preparation has been going really well. I’ve been playing matches against Rob and Paul so I’ve had the best quality training I can leading up to the Worlds. “The plan at the beginning of the year was to play the Czech Open but after the Europeans I had a six month training period and I came back and won in Italy so I sat down with the coaches and we decided it would be better to rest and be fresh for the Worlds.